Sarah Wierks registered yet another record-breaking rebounding performance on Saturday, but it went for naught as the University of the Fraser Valley women’s basketball team suffered a 79-72 overtime loss on the road to the Mount Royal Cougars. Wierks, the reigning CIS and Canada West female athlete of the week, hauled in an eye-popping 31 rebounds (12 offensive, 19 defensive), breaking the Canada West single-game mark of 29 established by Brittany Read of the Regina Cougars in 2013. But while Cascades led by as many as 14 points late in the third quarter and took a 59-46 cushion into the final frame, they watched the Cougars claw all the way back to take a late lead. UFV needed a layup from Katie Brink with 3.8 seconds left in regulation to force OT. Mount Royal’s Jayla Verney took over at that point, scoring nine of her 20 points in the extra session to lead her team to victory. Desiree Oakley also had a monster night for the Cougars, racking up a game-high 30 points. 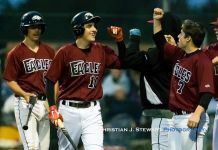 The Cascades (8-7) came into the weekend with an opportunity to clinch the third and final Explorer Division playoff berth with a two-game sweep, but the fourth-place Cougars (6-9) snuffed that possibility. The two teams meet again on Sunday afternoon (2 p.m. Pacific time, live stream at ufv.canadawest.tv). Brink also had a noteworthy outing for the Cascades – coming off a career-high 27 points in a win over UBC Okanagan last Saturday, the third-year topped herself with 29 points against the Cougars. But despite a decisive 55-41 edge in the rebounding department, the Cascades struggled to take care of the ball. They had 33 turnovers, compared to just 17 for the Cougars. The Cascades broke open a close game in the third quarter, reeling off a 14-0 run capped by a Kaitlyn McDonald three-pointer. That gave them a 59-45 lead. But they turned the ball over 10 times in the fourth quarter, opening the door for a Cougars comeback. Mount Royal led 68-66 after Tyleigha Nelson hit the second of two free throws with six seconds left in regulation, but UFV executed beautifully to force OT. The play unfolded just as Tuchscherer would have drawn it up on his whiteboard – inbounding from the Mount Royal side of halfcourt, Nataliia Gavryliuk tossed it to Wierks in the high post, and she flipped a sweet pass to a cutting Brink for a game-tying layup with 3.8 seconds left. In OT, the Cascades led 71-69 on McDonald’s jumper from the foul line with just under three minutes left, but the Cougars ended the game on a 10-1 run. 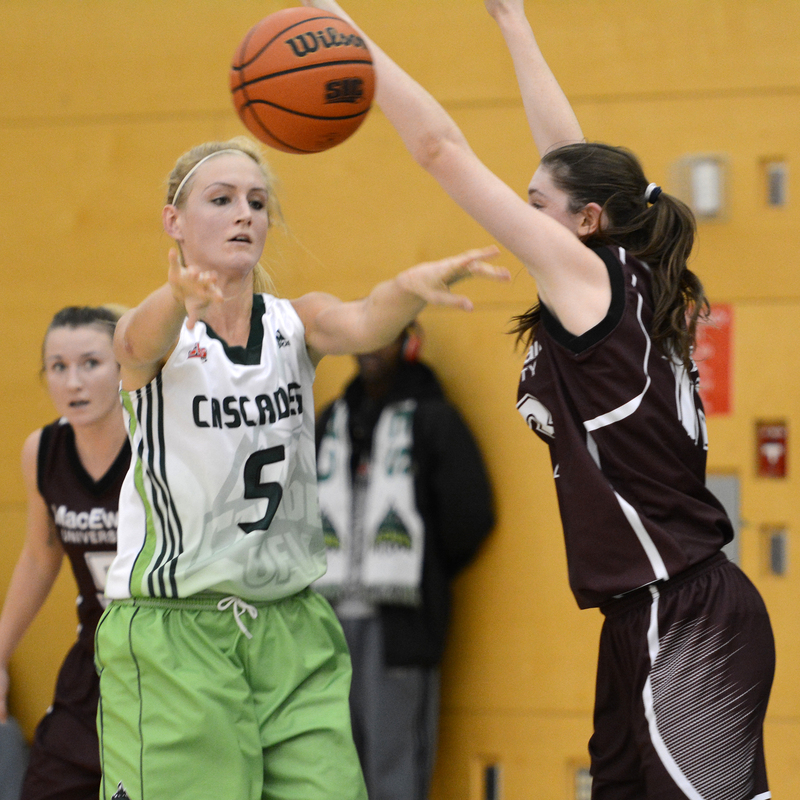 Point guard Celeste Dyck had 15 points and 12 assists for the Cascades, while McDonald finished with 13 points.